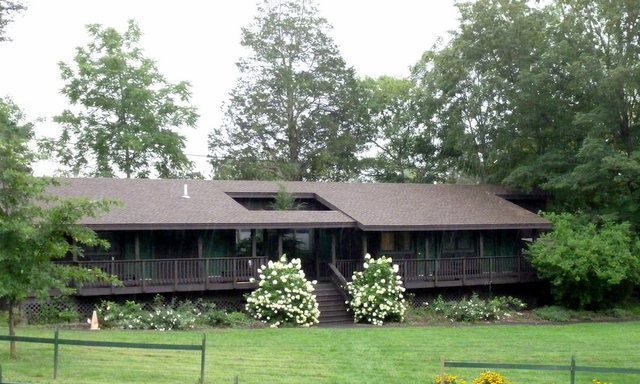 We heard from another tennis player at Hilton Head of this great tennis retreat in the Catskills. The food, lodging, locale, and tennis, we heard, were a really good deal. Last week we drove thirteen hours from NC to NY following a beautiful route on I-81 through Virginia and Pennsylvania, then I-84 and I-87 into NY. This is as pretty a drive as we’ve done anytime, routed through farmlands and wooded areas of really pretty states. Saugerties, New York derives its name from Holland Dutch, Zager’s Killetje. Zager (meaning sawyer or sawmill), and Kill meaning creek or stream, with the suffix “t j e” to indicate small or little. The sawmill was on the Esopus Creek. 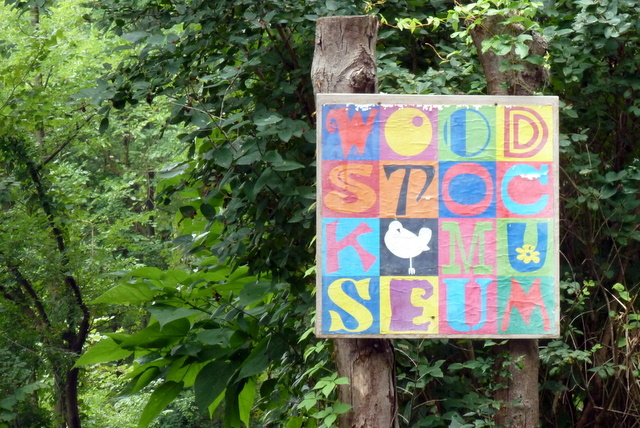 Saugerties Village is ten miles from the village of Woodstock but over fifty miles from Yazgur’s farm where the Woodstock music festival was held. 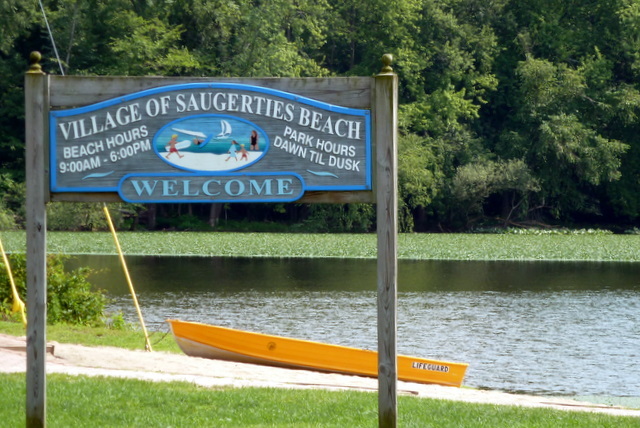 We drove around the village of Saugerties and to the Waterfront Park, a nice area with playground and beach with swimming area. 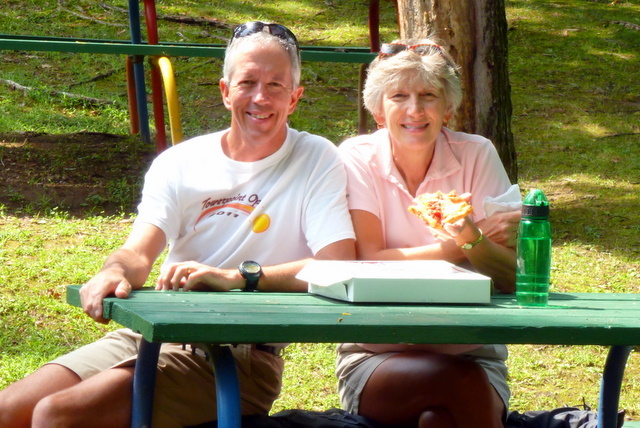 We arrived midday Sunday to Saugerties and found Seamon Park, a pretty little stream-side picnic place. We ate the leftover (and large and wonderful) half of pizza from last night’s dinner at Booty’s Place in West Hazleton, PA. The park has several interesting features. The first we noticed are the paint colors on the playground equipment — vivid primary colors on all the iron and wood. Some group spends a lot of time making this playground fun-looking. 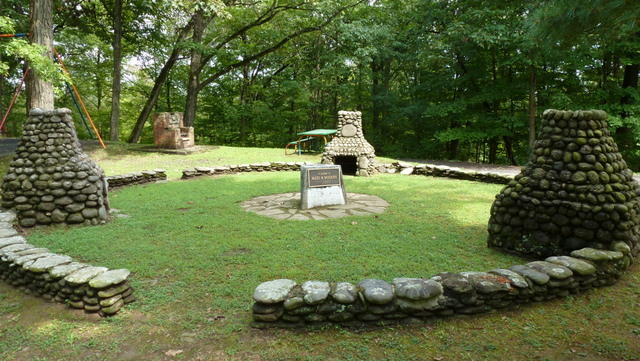 Second, the campfire ring with a stone monument at its center. Third, the not-so-old ruins from a mill’s sluice box and wheel house just below the parking lot and above the stream. Saugerties takes really good care of their park and we appreciated it. The campfire ring was built in 1929 by the Campfire Girls and has been lovingly maintained. The stone ring includes three stone fireplaces, each with an engraved center stone. The effect is suggestive of years of good times for many area girls. Campfire Girls originated in Maine just eighteen years earlier and was probably in its heyday during the building of this stone campfire ring and fire places. 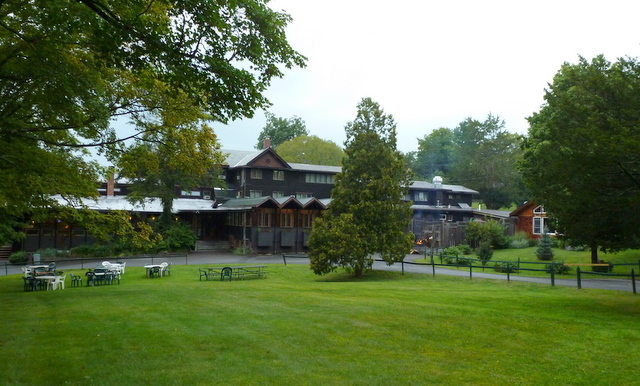 We arrived several hours too early for check-in at Total Tennis at the Katsbaan Lodge a few miles from Saugerties Village. Since we were so close (nine miles) to Woodstock we drove through beautiful countryside and found the village teeming with pilgrims, so many baby-boomers with silver ponytails. The week before was the 42nd anniversary of Woodstock Festival, looked like it attracted extra pilgrims. It still was too early for the 5:30 p.m. check-in to the Katsbaan Lodge so we spent an hour sipping coffee and enjoying free wifi to read emails and do a little work. Finally we had allowed enough time for check-out by the prior period’s tennis campers. The 4 p.m. check-out policy is really generous, allowing tennis through the afternoon lessons and time for a hot tub soak and shower before packing and departing. The Katsbaan Lodge consists of six buildings, a swimming pool, eighteen outdoor tennis courts, and an indoor tennis building. Our room was in the “new” building and was snug but perfectly adequate. We didn’t drive thirteen hours to sit in our room. If we wanted to bag the tennis we could hang out in the main lodge’s comfortable lobby or living room. We attended Total Tennis for three days of tennis and Total Tennis is the perfect place for it. We moved into our cozy little room, unpacked, and cleaned up. The room is a little more than ten feet by ten feet. We had a comfortable double bed with bedside lamps and powerful ceiling lights over the head of the bed. The bathroom was very compact with a nice corner shower with a narrow vanity to one side and on the other a commode. Like our Airstream’s, the bathroom is serviceable and appropriate to the amount of time we spend. We walked a few hundred feet to the main lodge for the seven o’clock dinner bell. A lot of folks had been visiting in the living room and swept into the dining room as we walked in. The lodge serves food cafeteria style and the food is extraordinarily good. We enjoyed roasted beets, roasted carrots, chard, tofu, quinoa, squash, onions, tomatoes, corn, and a wide variety of tasty meats. The abundant fresh organic vegetables are from the resort’s nearby farm. And the variety, presentation, and flavor of food impressed us. The vast majority of campers seemed to be from “The City”. We shouldn’t have been surprised but we thought we’d find more people from out of NY. One couple from Virginia, one FL woman (visiting her NY son), one Aussie couple living in Japan, a couple of Connecticut couples, the remainder principally from The City. We sat with Kenny and Wendy, Stephanie, and Melissa. Kenny and Wendy are from Long Island, Stephanie and Melissa from Manhattan. Everyone at our table at every meal was a lot of fun — maybe they came here to have fun, relax, and play a lot of tennis? We think so. Dinner was hamburgers, bbq, chicken filets, sauerkraut, salad bar, blond brownies, beer and wine. After dinner we sat around talking awhile then retired to our room for the night. Meal times were excellent for us. We became acquainted with many more people from FL, VA, NY, CT, and Australia, enjoyed talking tennis, travel, and family stuff. The dining room atmosphere is relaxed and comfortable, encouraging enjoying meals and making new friends. Monday morning we joined the whole crew for breakfast of granola at 7:30 then met at the bleachers at 8:30 for assignment to our instruction groups. The program director asked us to pay close attention to his descriptions of the USTA skill levels ( NTRP 2.0 through 4.0) and join the appropriate group for our abilities. Debbie’s was pretty easy, advanced beginner. Jim took a lot longer to get sorted into the right group. Debbie and two to three other players worked all six sessions with a young pro from Colombia. They liked their instructor and the consistency of working with one pro. Jim, on the other hand, worked with Lydia for one session, Sajiv and Tony for a session, Francisco for two sessions, then Sajiv and Tony for two sessions. Jim may have received the best diversity because each pro sees and offers something different. 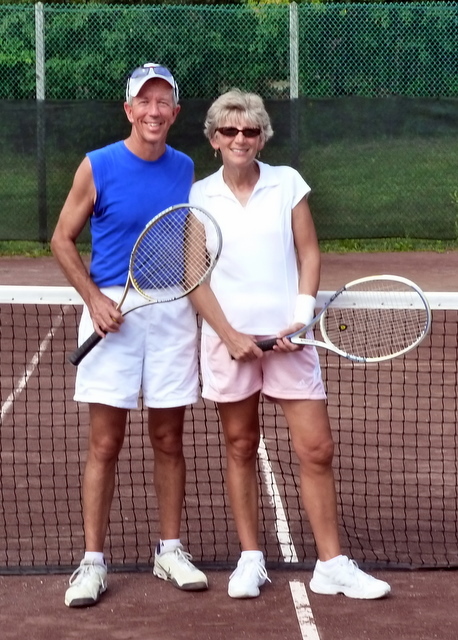 We’ve had a few opportunities to hit since we returned from Total Tennis. The lessons are still perking, we’re trying to incorporate what we learned into our regular hitting and play. This will take awhile but we have time. One of Jim’s high school classmates used to say, “what better to do with your time?”. Amen.